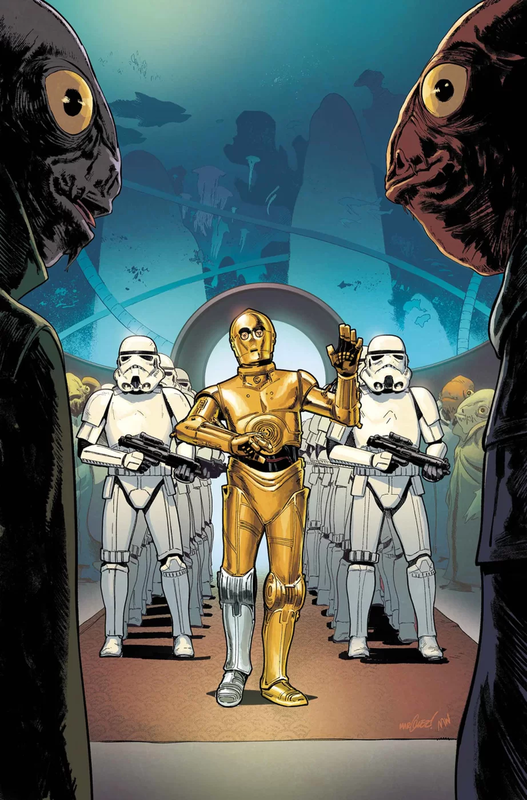 Star Wars #45 was the plan, and Star Wars #46 is the heist. With their Clawdite “ally” they kidnap a moff and make their way to the secret Imperial prison world to save Lee Char. For his part, Gillen does a great job of capturing the fun elements of a heist, which makes this one an enjoyable read. For starters, they have to persuade the Clawdite to help them. Then they have to infiltrate the event the moff is at. That means disguises. There’s a pretty funny bit in the bathroom with Han and Chewie. The action kicks in as they nab the Imperial. Then it’s off on another prison break. Each element adds to the action-adventure story that has that vibe of something like Ocean’s 11 or The Italian Job. Again, high marks on the writing. Gillen does a great job on the dialog and the story. Larroca back it up with some great visuals. All in all, this one earns a five out of five metal bikinis.